The Mitsubishi Outlander Sport has been in its second generation since 2010. The 2019 model receives a minor but notable mid-cycle refresh, complete with styling updates and feature improvements. With a starting price of just under $20,000, this compact crossover appeals to many simply because of its low cost. It has become the company's best-selling vehicle in the United States. 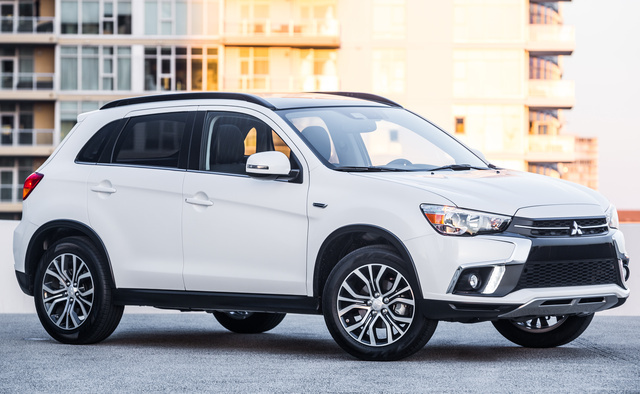 For 2018, updates to the Outlander Sport's exterior included new front and back bumpers, LED running lights, and a new rear skid plate and reflectors. The interior received a 7.0-inch Smartphone Link display screen with Apple CarPlay and Android Auto capability, a redesigned center console, and a new shift lever. A new Alloy Silver exterior color also became available. Under the hood of the Outlander Sport, you can choose between a 2.0-liter 4-cylinder engine rated at 148 hp and 145 lb-ft of torque, or a slightly more potent 2.4-liter 4-cylinder engine rated at 168 hp and 167 lb-ft. The smaller engine can be had with either a 5-speed manual transmission or a continuously variable transmission (CVT), while the larger engine is available only with the CVT. Buyers can choose either front-wheel drive (FWD) or all-wheel drive (AWD), although the top-shelf GT trim is offered exclusively with AWD. Fuel economy is decent for such a small vehicle---with FWD and an automatic transmission, the 2.0-liter engine manages 24 mpg city, 30 highway, and 27 combined, and the larger 2.4-liter engine gets 23, 28, and 25. The Outlander Sports with the 2.4-liter engine and AWD get EPA figures of 22, 27, and 24. The Outlander Sport isn't large, but it does sport more than 20 cubic feet of space behind the 60/40-split rear seats and 50 cubic feet with the seats folded. Inside the Outlander Sport, the base ES trim comes standard with a 4-speaker stereo and automatic climate control. Stepping up to the LE trim adds fog lights, heated front seats, an infotainment touchscreen, and a reversing camera. The SE trim gets an upgraded audio system and push-button start, while SEL models further add a power driver's seat, leather upholstery, automatic headlights, rain-sensing windshield wipers, and chrome exterior trim. Finally, the range-topping GT trim receives a sunroof and a premium audio system. A Touring package added in 2018 comes with a panoramic roof and several active safety features.